Yes, Tesla, we get it, your cars are super-safe. Wonderful, mazel tov, we'll send you a fruit basket. But because you guys let your safety rating go to your head, now you got NHTSA all mad and they had to get up and tell you to knock it off. You can only have a five-star rating. So take that 0.4 and shove it, they said. 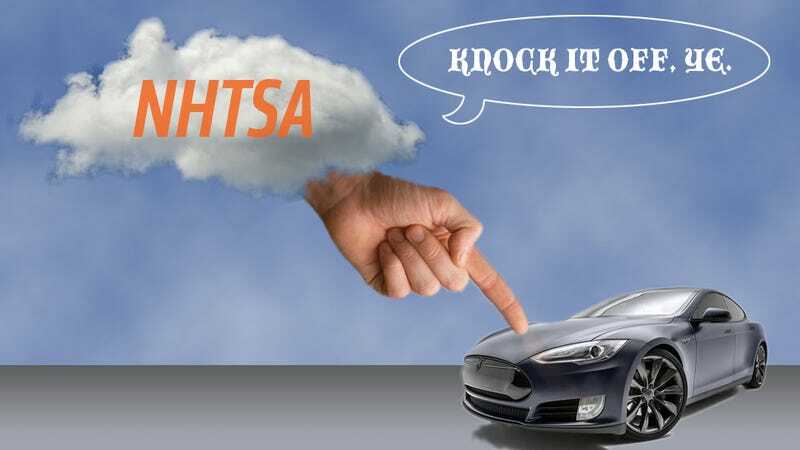 In fact, the NHTSA is so sick of Tesla bragging about their claimed 5.4 star rating that they published this PDF explaining, over and over again, that the maximum rating any car maker can claim is 5 stars. No claiming "double-5 star" ratings for multiple tests, no claiming "flawless" or "perfect" ratings — just stick to the number of stars — the whole numbers of stars — your car got. NHTSA does not publish a star rating above 5, however safety levels better than 5 stars are captured in the overall Vehicle Safety Score (VSS) provided to manufacturers, where the Model S achieved a new combined record of 5.4 stars. ... which still means Tesla did their own thing with the ratings standard. If they had the data that gave them the number, you can't really blame them for trying, but safety rating standards are one of those things that are important enough to keep everyone playing with the same tools. So that means no more than 5. This event can, in some ways, be viewed as an encapsulation of what Tesla's PR always seems to do: too much. The car already is getting the best rating it can. If they just let the technology speak for itself and not get all hyperbolic, they'd do just fine. Now, if they wanted to claim a new record of 89.3 Smiles per Gallon of Electricity juice, I'm sure no one would contest them on that.